Three other colour varieties taken along the Cape Peninsula area. Slightly raised tentacles highlighted. The tentacles on either side of the slightly raised one always lie flat, unless moved by a surge. 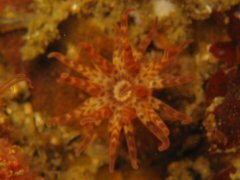 The first specimen of this small but striking anemone was photographed by Helene Zsilavecz at A-Frame. As it was unlike any anemone seen by SURG, a search was conducted to find it again, which took a few dives. 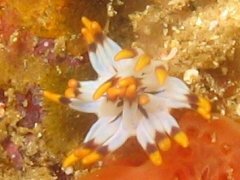 A study of photographs taken in the same area revealed that the species is not uncommon, and that it occured in a number of distinct colour variations; from pure white to pale red with a chevron pattern, to the "classic" yellow-tipped version first seen. 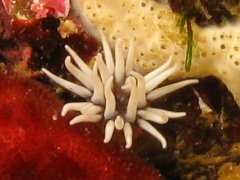 The resemblance of that variety to a court jester's hat is the origin of the common name of clown anemone. Since the first individuals seen at A-Frame it has since been seen all the way from Oudekraal, around Cape Point, and from Gordon's Bay south to Rooi Els. 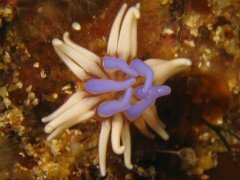 It occurs from a few meters depth to at least 20 m, but generally only on reefs slightly further offshore. 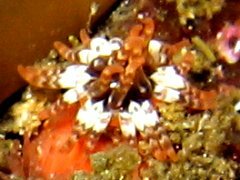 Interesting with this species is the arrangement of the tentacles, where six are always facing upwards, flanked on each side by an arm lying flat, with an arm slightly raised in-between. The colour-coded photos on the left show the arrangement clearly. During a field trip by scientists working on the Cniderian tree of life Dr. Estefania Rodriguez collected a few specimens for description.